New Zealand's prime minister Jacinda Ardern has vowed never to speak the name of the alleged Christchurch gunman and said the person responsible would face the "full force of the law". In an impassioned speech to the country's parliament, Ms Ardern implored others "to speak the names of those who are lost, rather than the name of the man who took them". "He sought many things from his act of terror but one was notoriety," she said. "That is why you will never hear me mention his name." She added: "Naeem Rashid died after rushing at the terrorist and trying to wrestle the gun from him. "Abdul Aziz, originally from Afghanistan, confronted the armed terrorist after grabbing the nearest thing he could find, a simple Eftpos (card) machine. "There will be countless stories of bravery, some of which we may never know. But to each of you, we thank you." Promising that the perpetrator would face the "full force of the law in New Zealand", she added: "The family of the fallen will have justice." "Our hearts are heavy but our spirit is strong," she said. On Monday, New Zealand's Cabinet made "in principle" decisions about gun law reform, with further details to be announced by next Monday. "There is anger that this happened here," she said. "There are many questions that need to be answered. The assurance that I give you is that they will be." People view messages at a floral tribute at the Botanical Gardens in Christchurch (AP Photo/Mark Baker)New Zealand Police Commissioner Mike Bush previously said police were confident one person was responsible for the shootings. "That doesn't mean there weren't possibly people in support and that is to form an important part of our investigation," he added. In the live-stream, a man inside a mosque appears to say: "Welcome brother", as a gunman approaches. 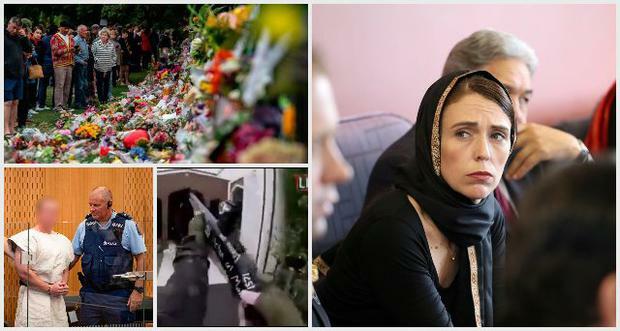 50 people were killed at two mosques in Christchurch (PA Graphics)Facebook said it had removed 1.5 million videos of the attack worldwide in the 24 hours after the shootings, 1.2 million of which were blocked at upload. "The video was viewed about 4,000 times in total before being removed from Facebook," he added. "Before we were alerted to the video, a user on 8chan posted a link to a copy of the video on a file-sharing site." He said the company was "working around the clock" to stop the video being posted on its site.